Are you going on holiday to Koh Pha Ngan in Thailand? If so you can read about the most interesting things to do in Koh Pha Ngan here. Koh Pha Ngan is the smaller sister island of Koh Samui situated in the Gulf of Thailand about 400 miles south of Bangkok. Koh Pha Ngan is smaller and more quiet than Koh Pha Ngan which means depending on what type of holiday you are looking for you may or may not want to visit Koh Pha Ngan. There is no airport of Koh Pha Ngan so the easiest way to reach the Island from mainland Thailand is via ferry from Surat Thani to Koh Samui and then a boat to Koh Pha Ngan. Despite it’s small size and relatively under developed tourist infrastructure, Koh Pha Ngan attracts your party goers from all over the world in their hundreds of thousands every year. This is because Koh Pha Ngan is where the Full Moon Party is held each month which holds legendary status among backpackers the world over. Once a month during the full moon, Haad Rin beach is populated with thousands of young party goers who walk between dozens of bars each blaring out their own music. Although generally safe, there are a lot of recreational drugs consumed at this party and there have been reports of increasing amounts of theft in recent years so be on guard. Aside from the Full Moon Party, Koh Pha Ngan is otherwise a very quiet, peaceful and some might find boring place to be. 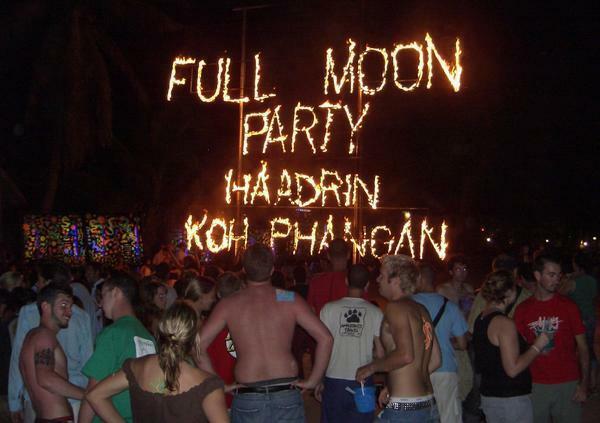 This is why many holiday makers prefer to stay on Koh Samui and simply travel to Koh Pha Ngan on the night of the full moon party. This is done easily enough as there are hourly boat connections between the two islands that run throughout the night. The real treasure in Koh Pha Ngan lies precisely in its underdeveloped nature and the fact that the nature, including the many idyllic beaches, can be enjoyed fully here. Perhaps here more than anywhere else in Thailand you are able to find beautiful beaches that are usually very quiet. Koh Pha Ngan has always been popular with the hippy crowd who are in search of something different. It is apt then that there are a few educational centres on the Island catering for such needs. Meditation courses are available on Koh Pha Ngan and can run from anywhere between 10 days and 3 months depending on how much time you have. Koh Pha Ngan is also home to a couple of yoga schools where you can go to relax and revitalize your body with this ancient Indian method of exercise. Depending on how much time you have and how serious you are you can go for a single lesson or stay there for six months learning to be a yoga instructor.